I’ve written about this a couple of times before and put up polls here on Lights in the Dark, but now it’s actually semi-official: you can vote on the names for Pluto’s newest moons! Earlier today, February 11 — which, by the way, is seven months to the day after the announcement of P5, Pluto’s 5th discovered moon — SETI Institute senior scientist and moon discoverer Mark Showalter put up a special poll site called Pluto Rocks. 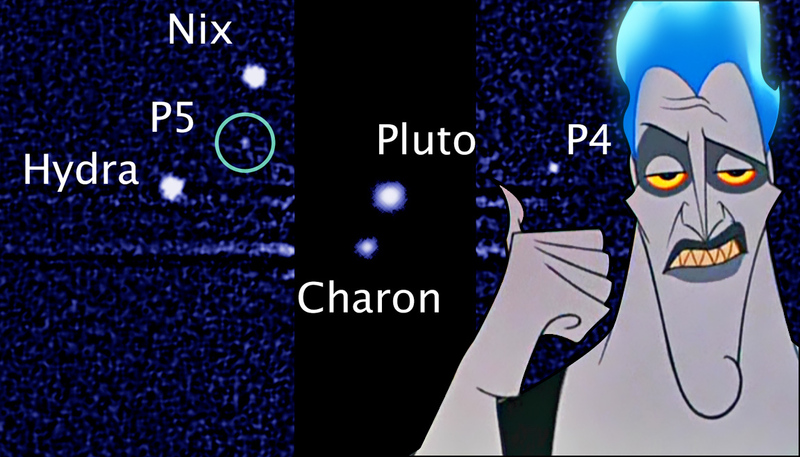 There you can place your vote on what you think they should petition the International Astronomical Union (IAU) to name P4 and P5, Pluto’s most recently-identified satellites. Per IAU convention, satellites of Pluto should have names reflecting the domain of either the Greek god Hades or the Roman Pluto. (So no Mickey, Goofy, Donald, etc.) But mythology is chock-full of characters, both major and bit players — there’s no lack of interesting names for a couple of moons! If you’ve voted here on the same thing before, thank you. But please go put your vote in on the SETI page as well — Mr. Showalter will be tallying the votes up himself on February 25 and using those to make his case to the IAU. This time, it really matters! VOTE HERE. I agree Jeff! A very romantic couple!